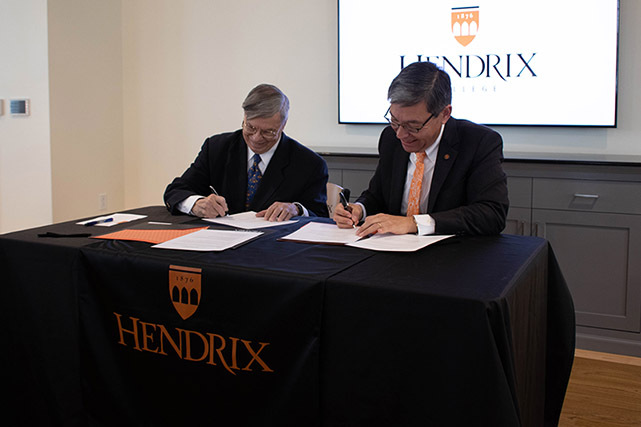 Hendrix College and the League of United Latin American Citizens (LULAC) of Arkansas have finalized an agreement that will offer Hendrix Aspire Scholarships to cover up to the full cost of attendance for a number of Federal Pell Grant-eligible students of Latinx heritage. Aspire Scholarships support the College’s commitment to making Hendrix accessible for qualified Arkansas students regardless of income level, and to encouraging diversity among the student body. LULAC Council 750 President/Deputy State Director Dr. Andre Guerrero, left, and Hendrix College President William M. Tsutsui sign a Memorandum of Understanding formalizing LULAC as a partner in the Hendrix Aspire Scholarship program. Hendrix covers up to the full cost of attendance—including tuition, fees, on-campus housing, and meal plans—for selected students affiliated with each Hendrix Aspire partner school or organization. In addition, Hendrix provides academic support services with the goal of ensuring that Aspire Scholarship recipients graduate in four years. The cohort-based program addresses common challenges among the students it serves. Hendrix President William M. Tsutsui and LULAC Council 750 President/Deputy State Director Dr. Andre Guerrero signed a Memorandum of Understanding (MOU) at a ceremony on Thursday, November 1 in the Mary Ann and David Dawkins Welcome Center on the Hendrix campus. Established in spring 2015, the Hendrix Aspire Scholarship program includes as partners the Arkansas Commitment program, Episcopal Collegiate School, KIPP Blytheville Collegiate High School, KIPP Delta Collegiate High School, Little Rock Catholic High School for Boys, Little Rock Central High School, Mount St. Mary Academy, Pulaski Academy, and now LULAC. There are currently 44 students attending Hendrix on Aspire Scholarships.